When a new town was started in the 1800s, there were no existing buildings to rent or buy. Even the materials needed for the new town were often a great distance away or had to be made locally. Timber had to be cut, transported and then sawed into lumber. The blacksmith made other items, but some items had to be brought by wagon and could take months to arrived. The solution for this was to start doing business in a tent. The tents used for this varied. Often the first tent was smaller, such as our 2005 version, because it could be brought with the first load of goods in the wagon. Over time a larger tent might be brought in. Over time the tent might get a wooden floor or even wood walls. 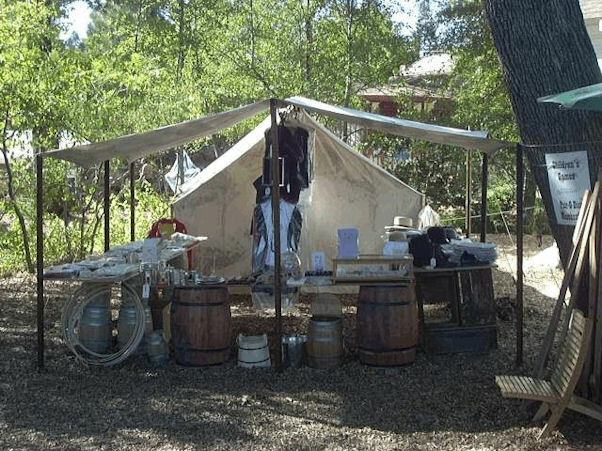 We have tried to recreate an 1880s drygoods tent store. 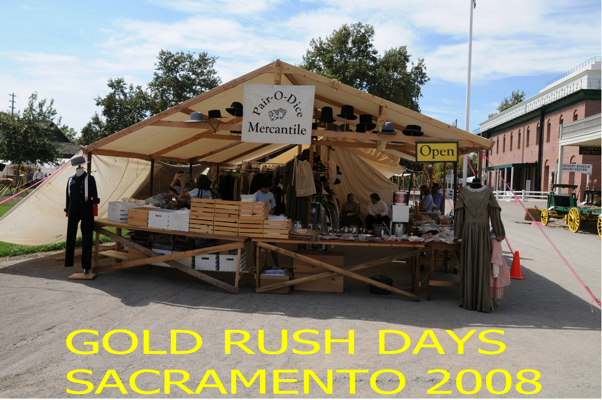 The 2005 version as it would have appeared when it first arrived in the town, including using shipping barrels and boards for tables. The 2007/2008 version is as it would have looked later on. We have stocked it with many of the items the new settlers in the area would need, including clothing, kitchen goods, personal items, toys, tack, soda pop and other items. Children can check out some of the period toys to play with and experience the toys of the 19th Century (1800s) children. There are also examples of children’s school items on display. If you visit, feel free to ask questions about what you see. Also, most of the items on display are available for purchase.